From the desk of Mrs Draper…. 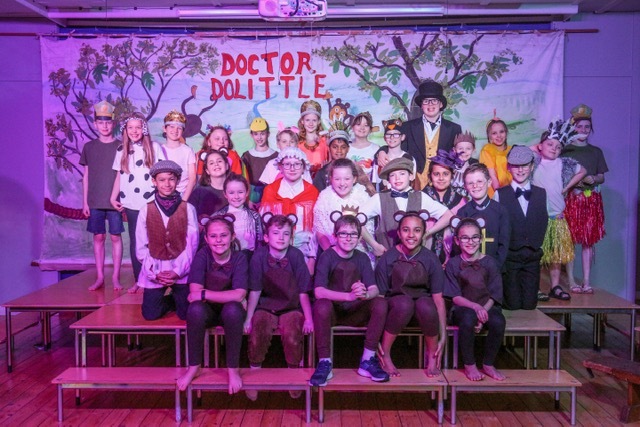 Year 4 and 6 recently had outstanding success with their production of Dr Dolittle, they gave three performances in the same week which took a lot of stamina. Well done to Oliver R in the lead role and to Jeyaan H who gave an exceptional comedy performance as King Jolli. Molly A and Isaac H worked together to give an amusing performance as the push-mi pull-u and there were excellent performances from Charlie P, Isabella C, Sophia S, Harry M, Josephine S, Indi S, Sofia B and Isabella P as the Dolittle animals. The villagers who were led by Jaya C as Sarah Dolittle were expertly payed by Sebastian N, Tilly M, Sophie L, Betsy A, Evan G and Nikhil S. Zachary M led the troupe of monkeys played by Sophie V, Ines G, Eva M and Kieran J who sang some lovely solos. Oliver K’s comedy witch doctor raised a lot of laughs and the royal household of the Jolliginkis were expertly played by Rosa S, Delilah C, Ben C, Ava B and Rupert B. The performance was ably accompanied by Jemima W on the piano. Year 6 and 4 performed the play Doctor Dolittle to their parents and the school this week. They were given their script in January and have been rehearsing and practising non stop. Their exhausting work has paid off though and the rest of the school loves it! Doctor Dolittle – played by Oli – is a funny and easily likeable character and the play is filled with enjoyable moments. The hilarious Pushmi-Pullyu is played with great enthusiasm by Molly and Isaac – the imaginative creature with two heads who picks on members of the audience. All the props are picked very carefully, matching the characters personality, such as when the horse – played by Ines – is given spectacles way too big for her! The Doctor Dolittle’s crew are loyal friends to their Doctor and are always there when he needs them. The Doctor’s crazy sister Sarah – played by Jaya – had already given up hope for the doctor and had left. Her village friends have tried to comfort her but she can’t help but feel worried for her dear brother. All the well-practised songs flow well and bring meaning to the story. The monkeys have a great part in the play and are lead by the chief monkey – played by Zachary – and the songs bring tears to your eyes – if joy or laughter! The production has gone really well and we hope that all the parents enjoy it! The audience really enjoyed the two evening performances – we are so very proud of each and everyone of you. Thank you to Mrs Draper for master-minding the whole production and we appreciate all the hard work from both the children and staff to make the production such a success. Never work with children and animals!